The moon and Jupiter kicked off a new year of skywatching Monday night (Jan. 2) in a cosmic rendezvous that amazed skywatchers around the world. During the celestial encounter, a skywatching sight known as a conjunction, the moon appeared just above Jupiter as the two objects moved across the nighttime sky. With Jupiter currently shining three times more brightly than the most luminous star in the night sky, the view was stupendous, skywatchers said. "This [was] an amazing conjunction of the moon and Jupiter," observer Polina Bozhkova of Minsk, Belarus, told SPACE.com in an email. Jupiter and the moon, which is in its gibbous phase, crept within about 5 degrees of each other as they crossed the night sky on Monday. For comparison, if you held out your arm and covered a patch of the sky with your fist, it would cover about 10 degrees. Jupiter and the moon provided a real treat for skywatchers with good weather. In Ontario, Canada, skywatcher Greg Maza braved a chilly winter night to snap the amazing sight, despite the icicles hanging from his roof. "Icicles, snow, the moon, and Jupiter!" Maza wrote SPACE.com in an email. "Zoom into Jupiter and you can even see its moons and some stars around it." And Maza wasn't the only one to see the moons of Jupiter. 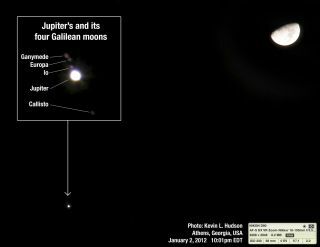 "I was able to image our moon and all four of Jupiter's Galilean moons in a single image," wrote observer Kevin Hudson, who created a composite image to compensate for the brightness of the moon. Hudson said he used an off-the-shelf Nikon D-90 camera and lens to snap the view. Other skywatchers timed their photos to coincide with an appearance of the International Space Station, creating long-exposure views that show the orbiting lab as a streak of light soaring 240 miles (386 kilometers) above Earth, with Jupiter and the moon shining in the background. Still others took a more tongue-in-cheek, or "jovial," approach to photographing Jupiter and the moon. In State College, Pa., skywatcher Sam Hartman decorated his sky scene with a vicious dragon — actually a model of the fictional beast Alduin from the computer game "Skyrim." In Hartman's photos, the dragon appears to roar skyward from a snow-covered perch as Jupiter and the moon shine overhead. The view was worth waiting out the "passing clouds and some strong snow squalls" to snap the photos, Hartman told SPACE.com. Jupiter and the moon aren't the only dazzling objects in the night sky this week. The bright planet Venus is making appearances in the evening sky just after sunset and can appear 3 1/2 times brighter than Jupiter. And the sights don't stop there. Tonight (Jan. 3) and early tomorrow, the annual Quadrantid meteor shower is peaking, promising up to 100 meteors an hour in the most optimum viewing conditions. The best time to see the meteor shower is at 2:30 a.m. EST on Jan. 4. To see the Quadrantids, look to the northeastern sky at or after midnight, and be sure to bundle up against January's northern winter chill. Editor's note: If you snap an amazing photo of the Jupiter, the moon, the Quadrantid meteor shower or any other skywatching sight, and would like to share it with SPACE.com, contact managing editor Tariq Malik at tmalik@space.com.